The developmental levels within our school-age program* are based on a set of core skills at each level. Upon achieving all 3 skills, the student will move up to the next main level within our program. Midterms are handed out during Week 4/5 and a Final Progress Report is distributed during the last week of the session. The Beginner class is the first level of our school-age developmental program. During this 60-minute class, children will learn an established routine including a 15-minute, interactive warm up, and three 15-minute rotations on that week's events. 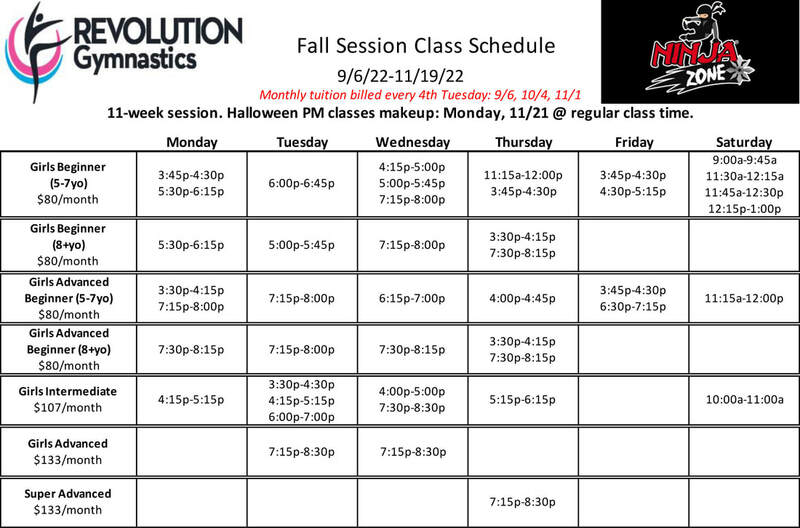 Class time will be divided between: vault, uneven bars, balance beam, floor exercise, and trampoline/tumble track. Progress reports evaluate students on the core skills required to move up to Advanced Beginner (backward roll on floor, handstand and cartwheel). The second level of our developmental program takes a step up from the Beginner class. Students will follow the same class routine consisting of a 15-minute warm up and three 15-minute events. Skills at this level are progressively harder and build the strength needed to advance through the program. The core skills students will be evaluated on are: handstand to bridge, stand to bridge kickover (or back walkover) and handstand forward roll. This is the highest level within our school-age program. At this level, students are pushed to excel on these three core skills: front handspring on floor, back handspring on floor and roundoff back handspring on floor. The 75-minute Advanced class allows for four 15-minute rotations after the 15-minute warmup. Students will expand their knowledge and skill set as they learn increasingly difficult skills on every event. This class helps students who have passed out of our Advanced class prepare for High School gymnastics. The emphasis is on advancing in the following areas: connection tumbling passes, tumbling and leaping on balance beam, front handspring and half-on vaults and uneven bar kips and connections. Additionally, strength, conditioning and flexibility are incorporated each week. Within this class, students will continue to build their gymnastics repertoire with a greater emphasis on form and strength.